I'm the type of fabric addict that stocks up on cotton goodness in large lumps rather than slowly over time. I'm sure I'm not alone in saying that some fabric lines are literally irresistible. On those days when you cross by a perfect line it feels like fate brought us together. The last few months I've been holding out on making major fabric purchases in anticipation of one specific line I knew was coming. That line is none other than The Birds and The Bees by Tula Pink! 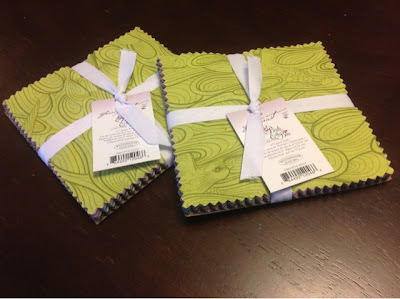 I purchased three charm packs and a charm pattern by Miss Rosie's Quilt Co. called Honeycomb. I'm new to charm packs and have never actually quilted with them before, so I thought this pattern would be the perfect way to get my feet wet. I absolutely adore the tone on tone prints in this line and can see myself stocking up on yardage of these prints in the near future. The day this line became available at the Fat Quarter Shop I submitted an order... and since shipping to Canada is only worthwhile when you fill a flat rate envelope I couldn't help but add in a few extra goodies. I've also noticed out in the blogosphere that when many of us quilters are chest deep in a current WiP, we tend to plot out the next 15 in line. I'll be the first to admit I have also been guilty of this, and this new Kona Cotton solids color card will help ensure I order just the right shades when inspiration strikes. Because I'm working on increasing the tone on tone patterns in my current stash, I thought this Nature Elements swatch card would also come in handy. Now that I have these charms laid out I want to do two things: 1) whip out my rotary cutter to get cracking on my next project, and 2) order more B&B yardage right away!